Contraband seized during Op Corona patrols. 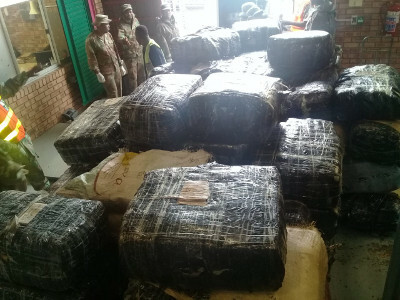 Soldiers have yet again seized hundreds of thousands of rands worth of illegal and counterfeit clothing and footwear destined for South Africa’s massive informal economy as part of the national border protection tasking, Operation Corona. The seizures all happened during the last week of January and were confined to South Africa’s land borders with Mozambique and Zimbabwe said Lieutenant Colonel Piet Paxton, SO1, Operational Communication at SANDF Joint Operations Division. In addition to fake footwear, soldiers deployed in Limpopo along the Zimbabwe border also confiscated 20 “master boxes” of Pacific Blue cigarettes from smugglers. This is the first major illegal cigarette haul in a number of months and bears testimony to a Tobacco Institute of SA (TISA) study last year showing South African smokers use more illegal than legal cigarettes. In most instances researchers found illegal cigarettes being sold for less than the government imposed tax of R17 per packet of 20. Clothing and footwear taken from smugglers on this section of South Africa’s land border included counterfeit Adidas, Jeep, Nike and Polo branded items valued at over R25 000. The KwaZulu-Natal border with Mozambique in the Ndumo area also saw confiscation action in late January. Just on 1 200 pairs of fake sneakers and trainers, the majority branded either Nike or Adidas with an estimated street value of over R1,4 million, were confiscated by soldiers during the last week of the first month of 2019. Last October saw soldiers strike a big blow to organised smuggling when more than R4 million worth of contraband clothing and footwear was confiscated in a single day on the Mpumalanga/Mozambique border. May last year saw soldiers confiscate fake footwear and bales of clothing conservatively valued at R2,6 million. There are currently 15 companies deployed on the border protection tasking with Reserve Force units making up more than half the number of soldiers deployed at any one time. When the national defence force was given back the border protection function it planned to expand Op Corona deployments to a maximum of 22 companies. This figure is unlikely to be reached due to budget constraints with the deployment seemingly set to remain at 15 companies for the foreseeable future.